Distinguished organist, composer, and educator, Dr. F.R.C. Clarke, served as Music Director of Sydenham Street United Church for forty-two years, retiring in 1999. 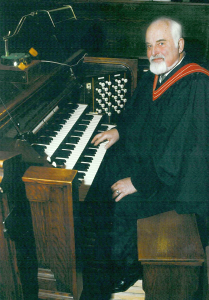 Dr. Clarke served as organist emeritus until his death in November, 2009. In the course of his career, Dr Clarke held various posts as organist-choirmaster, composer, teacher, conductor and administrator. His own teachers included Kenneth Ross (piano) in Vancouver, Eric Rollinson (organ) at the Royal Conservatory of Music of Toronto, Healey Willan, S. Drummond Wolff; and George Laughlin (theory and composition) at the University of Toronto. Dr. Clarke was organist-choirmaster 1950-8 for several churches in Toronto and St Catharines. He also taught 1956-8 at the Hamilton Conservatory (RHCM) and conducted 1957-8 the St Catharines Civic Orchestra (Niagara Symphony Association). In 1958 Dr. Clarke became organist-choirmaster at Sydenham Street United Church, a position he held until 1999. He was also conductor 1958-77 of the Kingston Choral Society. He lectured 1959-69 at Queen’s Theological College and joined Queen’s University Music Department in 1964 to teach theory and other subjects. There he founded and conducted 1965-9 the Queen’s Chamber Players Ensemble. He was head 1981-88 of the department, and after it was renamed the Queen’s University School of Music in 1988, he served (1988-91) as director. Of Dr. Clarke’s numerous compositions in the English tradition, Bel and the Dragon (1954) was written for his D. MUS., Sing a New Song to the Lord (1960) was composed for the United Church of Canada in commemoration of the 400th anniversary of the Scottish Reformation, and Psalm 145 (1966) won the CBC (Ottawa) Choral Composition Prize in 1967. Dr. Clarke was chairman of the music subcommittee for The Hymn Book of the Anglican and United Churches (1971), to which he contributed 7 tunes and 18 arrangements. His Festival Te Deum (1972) and Reginae (1991) were written for the Kingston Symphony Association to celebrate the tercentennial of the founding of Kingston and the sesquicentennial of the founding of Queen’s University respectively. Dr. Clarke has completed and orchestrated several of Willan’s works, including the Introduction and Allegro for string quartet, premiered in 1984 by the Vághy String Quartet, and the Dirge for Two Veterans and Requiem Mass, premiered in 1985 and 1988 respectively by the Kingston Symphony with the Kingston Choral Society. His recent composition, An English Requiem, was performed by the choir of Sydenham Street United Church in 2007 and 2008, with Dr. Clarke at the organ. One selection from the English Requiem was sung by the massed choir at Dr. Clarke’s funeral, a fitting tribute to this outstanding organist and composer. On Sunday October 17 a concert was held at Sydenham Street United Church to celebrate the music of Fred Clarke. The concert included works for choir, organ, solo voice, instrumental ensembles and more, presented by the SSUC choir and a number of local musicians. Many of Fred’s friends were able to join us as we honoured Fred and enjoyed some of the music he created over the years. Here are two of Fred’s anthems that were performed at the concert. On March 27 2011 the Kingston Choral Society and Symphony Orchestra presented Healey Willan’s Requiem as a tribute to F.R.C. Clarke. The story of how Dr. Clarke completed this work is told in an article by Sarah Pugh, President of the Kingston Choral Society.